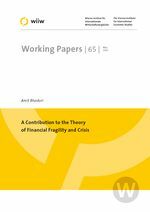 Three interrelated aspects typical of most financial crisis of domestic origin are brought together in a model in this paper. The first aspect is debt financed consumption boom supported by rising asset prices which ultimately leads to credit crunch and debt deflation as lenders lose confidence in borrowers. This is related to the second aspect tracing gradual evolution towards Ponzi finance. This is accompanied by fragility of the financial sector itself and its insolvency as an inevitable outcome of unregulated economic expansion. The paper concludes with comments on how these three aspects interact in the real world of possible extensions.